Disclosure: I received a free product to help facilitate the review. All opinions stated are genuine and my own. The bag I ordered from Melissa! Melissa, my bloggy friend from My Recent Favorite Books and Readingnks has recently become a Thirty-One consultant. You probably already know, but if you do not, Thirty-One is the trendy bag and tote company so many people have been mentioning in a positive way. I've seen blog posts about them, saw people carrying them in person, and have even seen them featured in my youngest child's school for a fundraiser project. 3 Pockets on the front (& two more on the back!). One net pocket on each of the sides. When looking for a bag or tote to buy, I want mine to be roomy, sturdy, and have more than one place to store things. Throw in cute, and a top-zipper, and I'm over the moon giddy. 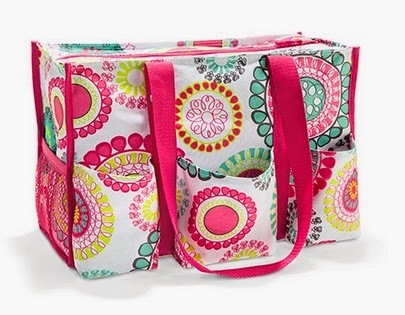 The Zip-Top Organizing Utility Tote by Thirty One, in the Citrus Medallion Print meets all of the above criteria and more! Generously sized at 10.25"H x 15.5"W x 6.5"D, and touting seven pockets (three on the front, two on the back, and one net pocket on each side) this bag holds a lot. I packed mine to see how much it would hold. I put in a full-sized beach towel, two swimming trunks, two swim shirts, and beach shoes (child-sized), and still had plenty of room left over. Sturdy enough to hold books! The bag is also very sturdy, so you could use it pack in larger, heavier items. I put in a few books, one that is 10" x 13" in size, and you can see there is still room left in the bag. & a zipper that runs across the top. This bag also has two sturdy hand straps, and a zipper that runs across the top. After reviewing this bag, I can definitely see what all the buzz is about because I love it!! You can also sign up for Melissa's newsletter, follow her Thirty-One Facebook group, and/or follow her Thirty-One board on Pinterest. Additional Giveaway: On April 30th, Melissa will be drawing a winner for a "Littles Carry-All Caddy" on her Facebook Closed Group! All members of her Facebook Closed Group are eligible to win! One lucky reader gets the same bag I reviewed (thank you, Melissa!!). My good friend sells 31, so I actually have that same bag, but in a different print. It's awesome! I use mine for the beach, but it would be a perfect diaper bag, too. I see they have on their site a ROOM TO GROW UTILITY BIN BROWN WOODBLOCK FLORAL and they also have monthly specials. I love specials!! I've seen people selling these bags but never knew what they were all about. I love bags that allow for room and that have pockets.. lots of pockets. Aimee, Many of the 31 bags have lots of pockets! The Personalization feature is great! so many options!! I love how much storage this bag has. Thirty-One really has great designs too! oh, i love thirty-one bags. i actually need to get a big cooler bag for summer for lunches at swim club!! i have a bag just like that without a zipper top and i love the zipper. jealous! 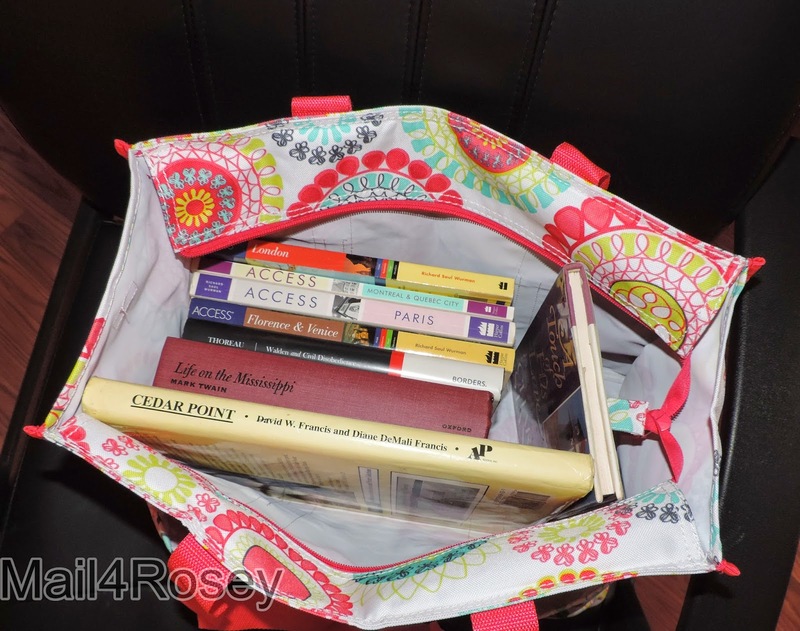 I have one of the Organizing Utility Totes without a zipper and use it all the time, to carry books! I actually quite like it when there's a bunch of pouches bc when I go to my boyfriend's for the weekend, I like to separate things... i.e. makeup in one pouch, keys in another, cell phone, etc. I wasn't familiar with thirty-one bags - I think I'll become a fan! 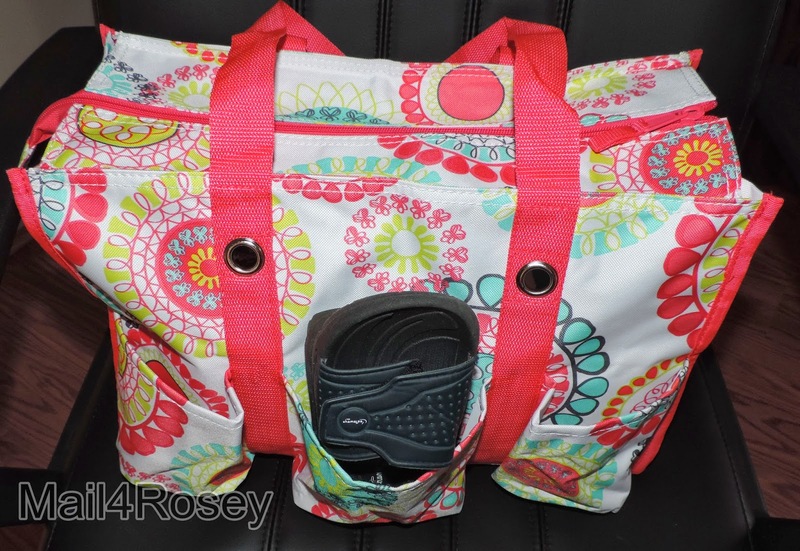 Ronnie, I think you will love the pockets on ( and in ) the Thirty-one Bags! You can even order a "add on" pouch to use on the outside of the totes! Have a great day Sandee! The Deluxe Utility Tote is a great size! I think that would be a perfect bag for the beach or the pool. It has so much storage and lots of pockets. The totes are great. I have one in the car. And, I'd like to own a new cross body purse! Krystyn, I agree with you! =) One of the new cross body purses is on my wish list! I love thirty one bag. I actually have two, they are very useful and I used it as a diaper bag too! I have heard such wonderful things about these bags and how spacious they are! Now I want one too! =) I have a wish list too ! That bag is gorgeous! Lucky thing. 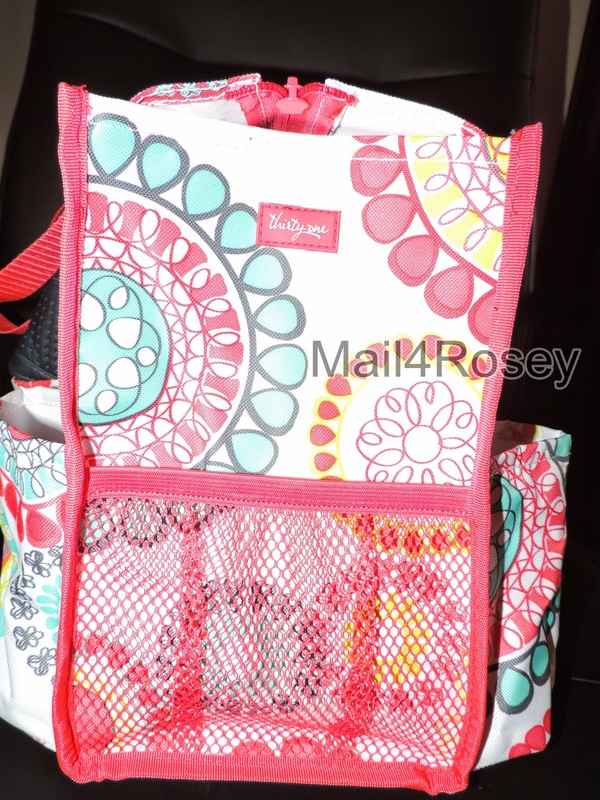 Cute new design my Thirty One - I really like Thirty One bags! I'm loving the design on the bag. I'm also loving the actual design of the bag itself! That's a great bag, I love the pattern. I really like how much stuff it holds! what a lovely bag and very useful especially to a book lover like me. What practical totes. I like Thirty-one products and the colors they come in. I own so many, yet not enough, bags from Thirty-One. I have a utility tote like this one for my couponing stuff, and a market tote for our frozen foods we buy when grocery shopping. I've also carried a few of their purses too! Kecia, I love the Market Totes that Thirty-One has! Such a great idea to take it grocery shopping with you! What a cute and colorful bag Rosey! Have a nice night! I seriously love 31 totes! I want one! I also love the Inside out bag! That's a really generously sized bag! I can think of lots of uses for that! The Perfect Party Set / CITRUS MEDALLION is adorable. There are so many cute things in such a variety of sizes! Thanks for the opportunity to do it. That's a great bag!! This is such a cute bag! I like that it has plenty of room for whatever you need to carry! We have one of the Thirty One casserole carriers and I love it. It keeps the dishes the correct temperature when ever I take them to dinners. Pam, I'm glad you like the Thirty-One Casserole Carriers! They are perfect for picnics and Holiday Get-togethers! I really like the City Weekender bag. We travel not far from home every now and again, and I need a bag that's not big like a suitcase, but just large enough to hold my essentials. That looks like the perfect bag for me! The thermals are great for picnics or shopping! What a gorgeous bag! I love how much it holds. I love retro fold over tote too. What a spacious bag! I could totally use this. I don't need a diaper bag anymore but let me tell you, a toddler requires me to carry around more things than I ever HAVE. I love the beautiful pattern and pockets! I love thirty one!! I would absolutely get the same bag you chose for the amazing space and I love the shape, but I would get the paradise pop/navy wave I saw on Melissa's page. So cute for a nautical summer! I learned that they sell stationery. We love 31 products! That bag would be great for baseball. I love the pattern on the fabric - very pretty. I have not heard of them before so I need to go check them out. It would also make the perfect gym bag. This bag looks great! I love good sturdy bags with lots of room and pockets! Wow, that's cool - perfect for anything outdoors! I've heard very good things too about them. And I do love a roomy bag! I have this utility tote, and LOVE it! I have been using it for over two years straight as our diaper bag. Such cute stuff. I just ordered my first 31 tote last week. They are ADDICTING! I love the fun colors and big sizes of the organizers. I love the Fresh Market Tote, such a cool idea! I have a couple of friends who sell their products. I've heard nothing but good! That looks like a great bag to carry everything but the kitchen sink. Lol. I love when a bag has enough room for all my stuff, without being humungous! I learned that 31 has some amazingly cute stuff! I love that organizing tote! These bags are cute! Reminds me of Vera Bradley bags. I love a cute tote that I can keep my stuff organized! La la love Thirty One! This pattern is fab! I love the pattern on the bag you show; and it's a great way to keep all my items organized. I have heard a lot about these bags and now I see why. They hold a ton of stuff! I could use one of these for overnight trips. I love a great tote! This one looks handy with a lot of pockets. Love the print, too! I have one kinda like that and I just love it! That one is very pretty! That bag is beautiful! I will have to check out their selection because I am in need of a new bag. I use them for trips or visits to our local lake. This is exactly the type of large bag I have been looking for to hold everything on days we go to the pool. I love how big and roomy it is. Your illustration on how it holds the large books with room to spare has sold me on it! i liked the PANTRY SET 4 OPTION A.
I could use this in the kitchen,badly! I Love this tote. It's super cute. I need to check them out since I am the cheer coach this year, that would be perfect for hauling my stuff . That is such a cute bag. I love the pattern! I also like the All-Pro tote. What a great bag! It looks so roomy, and it's super stylish. I really like the Thirty-One Cindy tote. Love all the different patterns; very stylish! The pro duffel is $80. I like thirty one bags. They are so stylish. I'm addicted to 31 bags. They offer some of the cutest organizational tools. OH! I LOVE 31!!! And this bag is so cute! I entered :) Thanks for the opportunity! I believe my wife bought something similar to the first one for a friend.. She likes these bags! I like the inside out bag. I found out that Thirty-One has some really cute note cards. I love that they have such great monthly specials! You are right, I am seeing these everywhere now! I really liked the -Product # 4182 Lunch Break Thermal! super cute.. I love these bags and totes, they sound really useful. I could use a tote for my trunk to keep groceries in place. I just discovered Thirty-One and I'm impressed with how well they are made! I love the Vary You Mini Crossbody! I like the wonderful hostess gifts and discounts that they offer, along with a wide variety of products. I love this bag, thanks for the giveaway. The patterns of the bags are so pretty. And oh so roomy! I know that Melissa is having a party right now to support her local Autism Walk. I will be placing an order, but still have no idea what I want....so many cute items...it is so hard to choose. I love the bag you have here. 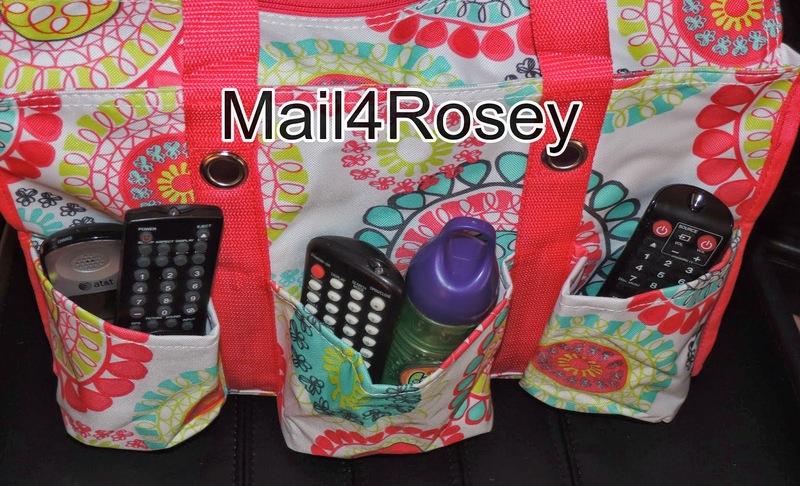 I learned that Thirty One has a lot of cool products for organization. I LOVE Thirty One Totes...they are super roomy and the only bag I ever buy anymore !! I like the Suite Cross N' Fold. This looks like a great bag to take out and about with the kids during road trips. It has a lot of space. Versatile, roomy and trendy. Love it! I love that there are bags with zippers. I need a closed bag. I've been coveting one of these bags! I like the City Weekender in the Navy Wave print. It's the perfect size for an airplane overhead compartment! I'm in *love* with Thirty-One! I want to own a Thirty-One bag one day. I checked out the hostess special - great deal. I wish I had time to put a party together, this stuff looks great! Nice bag. I have never owned anything Thirty One, but I bet this would be great for gardening and crafting. I have one like this that I used as a diaper bag, but it didn't zip on the top. Love this! I LOVE All The Storage & You Can Personalize It! I LOVE Thirty-One. I have a few bags and love them all. I even used one as a diaper bag. I'm DYING for another one! I love the 31 bags! So much storage options and the prints are so much fun! They have so many great bags. I love the prints. put your initial on it. I have actually purchased from this company before. The items are great. My Mom uses one that I got for her for carrying home groceries and when I asked if I could borrow it--she said NO-a big resounding NO!! I keep hearing about these bags but have yet to try one! maybe i'll win it! Thanks for the fun giveaway! I like the "Every-Wear Wallet". That is a great bag. I love how much space it has. I like the roomy tote with the pockets, and I also like the Free To Be Soft Wallet on the website. I love the Pro Duffel. Perfect size. I love bags like these-a lot of pockets and zippers helps keep things organised! 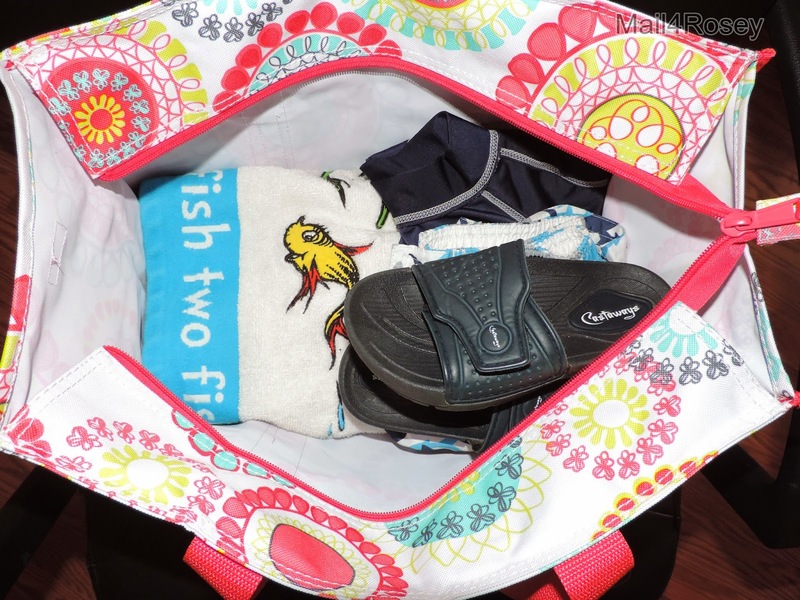 I love the deluxe utility tote due to its size and storage space. I love the Retro Metro tote. Great bag! It looks perfect to take with me when we go to the river or pool. It's big enough to fit everything you need to bring with you! Last chance for the Spring catalog. What I learned are that their bags are very spacious and what I liked is that their bags are quite practical with an abundance of pockets!!! I am going tot he 31 party in a few weeks and I am buying this style bag, love the pockets on the side, perfect for having 5 kids sippy cups! I like the DELUXE BEAUTY BAG! wow there are so many new patterns and designs. Last time I went to a 31 party was 3 years ago lol! I like the All - Pro Tote! I like the All-Pro Tote that's on sale for $25. Very cute! I will also be giving away a 31 "Littles Carry-All Caddy" on my Facebook Closed Group on April 30th! All members of my Facebook Closed Group will be eligible to win! I learned that you can add Icon-It for $5 without text or $7 with text and the icons are pretty cute. I like the SUITE SKIRT / BOLD BLOOM. I love the Inside-Out Bag in Lotsa Dots. I really like the Cinch Sac.I also also really like this tote the easy breezy it has a nice pattern. I love the Easy Breezy Tote. So colorful!! I love the pro tote. Les sacs sont magnifiques , mon préféré " causual cargo purse " . Écrire le mot tea sur un sac , faut le faire !!! I love that you can personalize them. it's a great touch! I like the Cinch-It-Up Super Sac in the Paradise Pop print. Thanks. I liked- loved- http://www.thirtyonegifts.com/catalog/product/284/catid/13/swid/587x/ Gracias for the Giveaway! I like the hang up home organizer. I'd love to have the Hang-up Home Organizer & Fold N File for my home. I have a lot of Thirty-One Bags, but none with a zipper! I wish that all the totes had them because the cats get into mine :) I love the April special for the $25 bags! Good deals. I like the Free to Be™ Carry-All / Cabana Twill Stripe. I like the suite cross body purse a lot. I like the Fresh Market Thermal Tote. I love all the totes, especially the Easy Breezy Tote. Great spring prints. Thanks for the giveaway. CINCH SAC / CITRUS MEDALLION is super fun. I really like the Retro Metro bag! Organizing Shoulder Bag in grey brushed twill. I like this EURO STRAW TOTE / CORAL STRIPE. I love 31 totes! I want one! I really like the Thermal tote in the Paradise Pop. Great for when I do my monthly shopping. I learned that in April you can get the All-Pro Tote for $25. It is a really nice bag. I love the April special of the All-sports tote. It looks like an amazingly useful tote! I like the every wear wallet in swiss dot. I would love this same print in the lunch break thermal! Thanks so much for the chances to win. I like the Free to Be™ Crossbody / Railroad Denim. i like that they have such fun patterns on the fabric of the bags. i am tony l smoaks on rafflecopter. I love the Large Utility Tote. I could put tons of stuff in there! I like the Lunch Break Thermal. Thank you! I like that you can become a consultant for only $99! You get alot of stuff for that price too! I love that they have tons of pockets and organization!